and the Roman Catholic St. Hedwig Cathedral (below). A mosaic of religious beliefs and houses of worship enrich the urban mosaic of all of the cities on this tour, but it is worth highlighting a few structures in Berlin partly because of the dramatic role of religion in the city's past and the fact that these buildings are scattered throughout the city, requiring the tourist to plan carefully should they appear on a list of locations to visit. Neue Synagoge (New Synagogue) -- Located on Oranienburger Straße in the former East Berlin, the New Synagogue was built between 1859 and 1866 in a Moorish architectural style and was the most important synagogue in Berlin. Its interior suffered damage during Kristallnacht on 9 November 1938, but the Berlin police dispersed the Nazis and spared the building from major damage. Allied bombing near the close of the war damaged the structure. The facade and towers standing today are reconstructions, and the synagogue is smaller than it once was. See http://www.or-synagoge.de/html/en_homepage.htm. Rykestrasse Synagogue -- This synagogue in Pankow, once a part of East Berlin, is Germany's largest. It saw relatively little damage during Krystallnacht, and during the war it was a warehouse. It survived the Allied bombings and became the synagogue of a small Jewish congregation in Berlin in the German Democratic Republic (Communist East Germany). It has been restored and reopened in 2007. An article in Der Spiegel about the synagogue is located at http://www.spiegel.de/international/germany/berlin-s-jewish-community-celebrates-germany-s-biggest-synagogue-reopens-a-502986.html. Jüdisches Gemeindehaus (Jewish Cultural Center) -- Although not actually a synagogue, the Jewish Cultural Center on Fasanenstraße, in the former West Berlin, was built on the ruins of the Fasanenstrasse Synagogue. The original structure was completed in 1912 and was in the Neo-Romanesque Style, but it had Byzantine elements as well, particularly apparent in the dome. A Nazi mob burned it during Krystallnacht, and Allied bombing destroyed what was left of the building. In 1957, the new Jewish Cultural Center opened with a few elements of the synagogue incorporated into its modern facade, such as the main entrance. Information is available at http://www.homeandabroad.com/browse/details/sites.ha?mainInfoId=113524. For additional information on synagogues in Berlin, see http://www.berlinfo.com/Lifetime/Public/public_religion/religion_jewish/jew_synagog/index.htm. Berlin Cathedral (Berliner Dom) -- This originally was a Baroque structure that the architect Karl Friedrich Schinkel (1781-1841) remodeled using the Neo-Classical style. In 1893 it was demolished, and the architects Julius Raschdorff (1823-1914) and his son Otto Raschdorff (1854-1915) constructed a new church in the Neo-Renaissance style. The dome was damaged during Allied bombing in 1944, but the East German government had it repaired. It currently is the seat of the Evangelical Church. The church has a marvelous interior (see the photo above), and the dome gives one a spectacular view of the city. The web site for the church is http://www.berlinerdom.de/index.php?lang=en. French Cathedral (Französischer Dom) -- When the French king Louis XIV (reigned 1643-1715) revoked the Edict of Nantes, Protestants, known as Huguenots, fled France. Many made their home in Berlin, where they formed a significant minority and gave the city's culture and language an international flavor. Their main place of worship became the French Cathedral, which was constructed in the early years of the eighteenth century, with the addition of the tower in the 1789s. The tower, which sustained damage during the Second World War, provides a view of Berlin, and there is a museum to the Huguenots in the church. German Cathedral (Deutscher Dom) -- This structure is opposite the French Cathedral and is identical to it. No longer a church, the German Cathedral houses the Museum of the Bundestag, the German Federal Parliament. The German Cathedral was almost destroyed during the Second World War. Both the French and German Cathedrals are in the former East Berlin. Its web site is http://www.bundestag.de/htdocs_e/visits/besgrupp/histaust.html. Kaiser Wilhelm Memorial Church (Kaiser-Wilhelm-Gedächtniskirche) or the Gedächtniskirche -- Wilhelm II (reigned as emperor 1888-1918) named the church, which began construction in 1891, after his father, Wilhelm I (reigned as emperor 1871-1888). The Neo-Romanesque structure suffered heavy damage during the Second World War, and its stabilized ruined spire, which West Berliners refer to as "the Lipstick," serves as a memorial to the war. Behind the original church is a 175-feet hexagonal tower whose lower level contains a church. The blue stained glass gives the interior a surreal glow and creates a peaceful atmosphere. The designer of the new structure was the well-known German architect Egon Eiermann (1904-1970). St. Mary's Church (Marienkirche) -- The East German regime celebrated its Lutheran roots as separating it from the Protestant and Catholic West German state, and it began restoring the Marienkirche, which had been damaged during the war, shortly after the foundation of the German Democratic Republic. Originally a Roman Catholic Church and now an Evangelical Church, the congregation dates from at least the thirteenth century. The entrance of the church boasts one of the most important "Dance of Death" murals in the world that dates from 1484 and is 22.6 meters long. 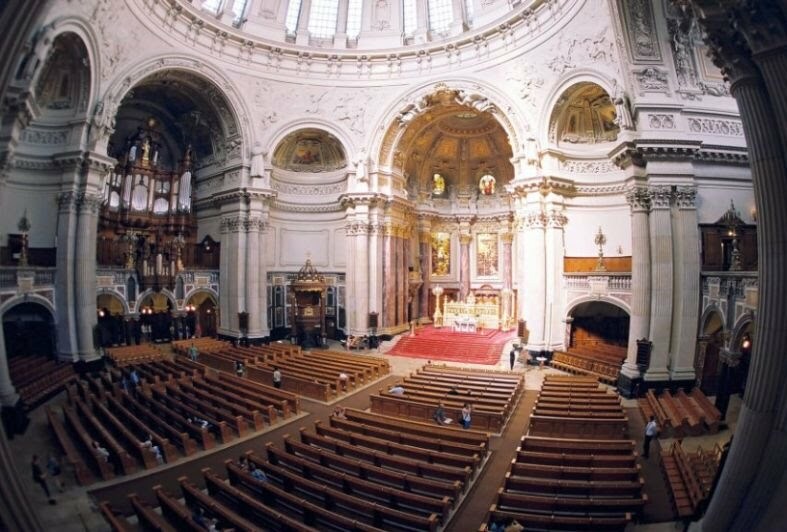 St. Hedwig's Cathedral (Sankt-Hedwigs-Kathedrale) -- Some Catholics were in Berlin after Frederick the Great (reigned 1740-1786) took Silesia from the Habsburg Monarchy, and Frederich, who promoted religious tolerance, permitted the Catholics to have a cathedral. According to legend, the architect asked him what the church should look like, whereupon he turned his coffee cup over on its plate. In reality, the Roman Pantheon was the inspiration for the church. Bombing heavily damaged the structure during the Second World War, and reconstruction took a decade. The three-manual organ, installed in 1977, has pipes made of stainless steel that give it an ethereal sound. The web site of the cathedral, which is in the former East Berlin, is http://www.hedwigs-kathedrale.de/en/domgemeinde/welcome. The Communist regime of the German Democratic Republic, also known as East Germany, built the Berlin Wall beginning in August 1961 to prevent educated and skilled workers from fleeing to the West. Once 87 miles long, only portions of the wall exist today, but a brass strip between the Brandenburg Gate and the Reichstag as well as other markers show where it once was. The popular breaching and partial destruction of the wall on 9 November 1989 became symbolic of the collapse of communism in the Soviet satellite countries. For those interested in cold war history, Berlin is an important focus of attention with plenty of sites that were crucial in the relations between the two Germanies but also between the United States and the Soviet Union. The most iconic item of the cold war is the Berlin Wall, whose construction began on 13 August 1961 and whose destruction began on 9 November 1989 at the hands of exuberant East and West Berliners. The ugly structure, which meandered between West Berlin and East Berlin, is largely gone, but there is a bronze strip in the street that runs behind the Reichstag and in front of the Brandenberg Gate that marks the location of the wall and various segments remain. One is near the former Luftwaffe headquarters, which served as the location of several government ministries and offices during the cold war and now is the location of the Ministry of Finance. Not far from the former Luftwaffe headquarters is the former location of Checkpoint Charlie (Friedrichstrasse near Zimmerstrasse) that was the the fabled portal between East and West Berlin. Nearby on Friedrichstrasse is the museum "House at Checkpoint Charlie." The the original booth from Checkpont Charlie is at the Alliertenmuseum that is southwest of the city center (http://www.alliiertenmuseum.de/). The wall went through Potsdamer Platz, an area that the war and the cold war transformed from a lively part of the city to a no man's land. Since it was cleared of buildings, it was open to development after German reunification and hosts the latest chic shops and offices. In early March 2013, protesters saved a small segment in one of the few remaining parts of the wall that developers wanted to demolish to make way for an entrance to new luxury accommodations. They unveiled a banner that read “Capitalism vs. History” (for more information on the story, click here). It appears that public pressure may manage to preserve permanently the last portions of the wall. The Berliner Fernsehturm or Berlin Television Tower in East Berlin, built between 1965 and 1969, raises to a height of 368 meters (more than 1,207 feet) and is the tallest structure in Germany. It contains a revolving restaurant and an observation tower. Built to serve a practical purpose, the tower also was a symbol of German Communism visible to West Berliners. The tower became an embarrassment for the regime in the DDR because the sun shining on its tiles causes a reflection that appeared to be a cross, giving the Fernsehturm the informal name of "the Pope's Revenge." In the eastern part of the city, not far from the Berliner Dom, stood the Stadtschloss, the old royal palace. Heavily damaged during the war, the communist-led German Democratic Republic regime demolished it and erected the Palace of the Republic (Palast der Republik) to serve the needs of the legislature. East Berliners referred to it as the Ballast der Republik (ballast instead of palace) and Erichs Lampenladen, that is, the Lamp Shop of Erich Honecker (1912-1994), who between 1971 and 1989 led the country's Socialist Unity Party of Germany. In 2008 the demolition of the Palace of the Republic was complete, and work began to rebuild the Stadtschloss. Not far from the Berliner Dom are the gigantic statues of Karl Marx (1818-1883) and Friederich Engels (1820-1895). Get a picture while holding the hand of Engels causes one to remember what it was like to hold the hand of a parent as a toddler. Other points of interest in the eastern part of the city from the cold war era are the Fernsehturm (see the caption for more information) and the Weltzeituhr or world clock at Alexanderplatz. While walking in the eastern part of Berlin, notice the apartment houses and other structures built in the socialist realist style. In comparison to similar structures elsewhere in the former Soviet Bloc, these are of excellent quality and are far more aesthetic. The East Germans had little choice in the matter because they could not afford to have their population believe they were impoverished in comparison to the West Germans because while the regime restricted travel, it could not block television and radio waves. Furthermore, partly because of trade with West Germany and its important industrial products needed throughout the Soviet sphere of influence, the German Democratic Republic had the best per capita income in the Soviet Bloc and it could afford to invest more in housing and other structures. In the West, not far from the Brandenberg Gate in the Großer Tiergarten, is the memorial to the Soviet Army that the Soviets erected. Flanking the monument are two of the famous T-34 Soviet tanks that were so effective against German forces on the Eastern Front. The stones used to erect the monument are not from the Chancellery of Adolf Hitler (1889-1945), but sometimes myth is more entertaining than reality. However, red marble from the former Chancellery covers the walls of the Mohrenstrasse metro station on the U2 line. One of the most important symbols of the West was the KDW department store that always was stocked with an abundant supply of the latest goods to make the East Germans envious (see Shopping in Berlin below). On John-F.-Kennedy-Platz, thousands listened on 26 June 1963, as the American president, John F. Kennedy (1917-1963; president, 1961-1963), standing at the Rathaus Schöneberg, West Berlin's town hall, uttered his famous words in German: "I am a jelly doughnut!" Unfortunately, he said "Ich bin ein Berliner," which meant he was a piece of pastry, rather than stating "Ich bin Berliner." The Berliners laughed, and they still do, but because Kennedy was not a citizen of Berlin, the presence of the indefinite article ein technically was correct. It was precisely two weeks shy of the twenty-fourth anniversary of that speech that another American president, Ronald Reagan (1911-2004; president, 1981-1989) stood in front of the Brandenberg Gate on the western side of the Berlin Wall and called out to Michael S. Gorbachev (born 1931), the leader of the Soviet Union: "General Secretary Gorbachev, if you seek peace, if you seek prosperity for the Soviet Union and eastern Europe, if you seek liberalization, come here to this gate. Mr. Gorbachev, open this gate. Mr. Gorbachev, Mr. Gorbachev, tear down this wall!" It was a marvelous piece of propaganda, but in reality, it was not Nikita S. Khrushchev (1894-1971) who built the Berlin Wall, that was the work of the East German regime that wanted to stop the emigration of educated and skilled individuals to the West, and it was not Gorbachev's place to tear down the wall. When the hard line East German leadership was under fire two years later, Gorbachev ordered Red Army troops to remain in their barracks and pledged not to interfere in East German politics. He kept his promise of noninterference when the regime announced that it would remove the wall. Joining East and West Berlin throughout the cold war was the metro. The U2 line was divided, with the eastern portion functioning and stations in the western portion becoming markets. The U6 and U9 lines in the West continued to function, but the authorities in East Berlin closed the stations on that side and posted guards at the entrances. Altogether, on the S-Bahn and the U6 and U8 lines, there were 16 so-called ghost stations. The Friedrichstraße, on the U6 line, functioned as a station on the East Berlin side, even though it was on a West Berlin line, because it was a border crossing. It also was an intermodal transportation station since it also was an East German S-Bahn train station. To prevent escapes, the East Germans erected a concrete wall so that nobody could hang on to the outside of the metro. A wonderful guide book for Berlin during the cold war, although in German, is Maik Kopleck, Past Finder Berlin, 1945-1989, 5th rev ed.(N.p. : PastFinder Ltd., 2010). Other conventional guides also contain bits and pieces of information about Berlin during the cold war. With about 175 museums, Berlin offers something for everyone. Each of the museums has its web site, and the Berlin city web site (see Travel Links) is also useful, but there are two web sites that specifically deal with museums. One serves as a single web site for all the museums: http://www.museumsportal-berlin.de/ (in German, but most museums linked through this site have English pages). The second is a private site that provides a very reasonable list of the top 20 museums: http://www.berlindude.com/berlin-museums.html. There are twenty museums--among them the most popular in Berlin--that are a part of the State Museums of Berlin, the Prussian Cultural Heritage Foundation (Staatliche Museen zu Berlin, Preußischer Kulturbesitz), whose general web site is http://www.smb.museum/smb/home/index.php?lang=en. Above: The Jewish Museum in Berlin by the Polish-American architect Daniel Libeskind. For those interested in the arts, among the most crucial museums is the Pergamonmuseum (simply known as the Pergamon), at http://www.smb.museum/smb/standorte/index.php?p=2&objID=27&n=17, which includes the Altar of Zeus from Pergamon as well as the Processional Way of Babyon with its Ishtar Gate. On the exterior, be sure to notice some of the damage to the facade from the Second World War. One also should consider visiting the Gemäldegalerie (Picture Gallery), at http://www.smb.museum/smb/standorte/index.php?p=2&objID=35&n=5, with its works from the brushes of Europe's old masters. The Neue Nationalgalerie (New National Gallery), at http://www.smb.museum/smb/standorte/index.php?p=2&objID=31&n=16, contains twentieth-century works and is one of the architectural masterpieces of the German architect Ludwig Mies van der Rohe (1886-1969), who was the last head of Bauhaus from 1930 to1933 and then worked in America, where he built 860-880 Lake Shore Drive in Chicago (1949-1951) and the Segram Building in New York (1954-1958) in the International style. One of Berlin’s newest museums is the Museum für Fotografie (Museum of Photography), at http://www.smb.museum/smb/standorte/index.php?p=2&objID=6124&n=14. Visitors to Berlin who wish to devote some time to historical topics should consider the following museums: Deutsche Historische Museum (German Historical Museum), at http://www.dhm.de/ENGLISH/; DDR Museum (Museum of the GDR, that is, the German Democratic Republic, at http://www.ddr-museum.de/en/; Mauermuseum (Wall Museum), at http://www.mauermuseum.de/, which has free admission; and the Stasimuseum (Stasi Museum), at http://www.stasimuseum.de/en/enindex.htm, which focuses on the secret police of the DDR. There are museums that do not specialize in the history and the arts, and among them is the Jüdisches Museum Berlin (Jewish Museum of Berlin), at http://www.jmberlin.de/main/EN/homepage-EN.php, which is the work of the architect Daniel Libeskind (born 1946), who rebuilt New York's World Trade Center, and the Ethnologisches Museum (Ethnological Museum) http://www.smb.museum/smb/sammlungen/details.php?objID=56&lang=en. Like other major cities, there are museums dedicated to music and musicians, science and technology, transportation, the decorative arts, architecture, and more. The Olympic Bell, now a memorial on the grounds of Berlin's Olympic Stadium, once chimed in the nearby bell tower. Soviet troops caused a fire that damaged the original bell tower, and British troops demolished the structure, allowing the bell to fall and crack. A new bell now hangs in a reconstructed tower that is visible in the background of the photo above. When Berlin hosted the 1936 Olympics, the black American runner Jesse Owens (1913-1980) won four gold medals. Adolf Hitler initially shook the hands of only Germans who won medals, but the Olympic committee balked at his selective recognition, so he ceased the practice. In his first memoir, Albert Speer (1905-1981), Hitler's architect and friend, noted Hitler's annoyance with Owens's success. For Hitler and other devoted Nazis, the blacks, whether were they were from Africa or America, along with the Slavs, Jews, Roma (Gypsies), and others were inferior races, that is, the Untermenschen. Berlin faced massive destruction during the Second World War, particularly toward the end of the war as a result of the Allied fire bombings of the city. More than 20,000 people lost their lives. About half of the housing was destroyed, and much was uninhabitable. Finally, many architecturally important structures were heavily damaged or intentionally demolished. Nevertheless, much has survived, and a little research and legwork will lead one to a number of sites in the center of Berlin or a short distance away using public transportation that recall Germany's unfortunate Nazi past. 1933-1945:mA Guide through Nazi Berlin. publication is available only in Germany. Gay, Nick. Berlin Then and Now. Then and Now. San Diego: Thunder Bay Press, 2005.
ed. London and Berlin: Foxley Books, 2008. Traces of German History. A Guidebook. a-1575988. Note that this last address is part of the web site of Deutsche Welle, the international broadcasting service of the German government. There are also day tours and partial day tours on line that specialize in Berlin's Nazi past, but signing on to such tours is never quite as satisfying as planning an adventure on one's own. Selecting and finding sites independently also enables one to spend the time needed to appreciate the site and not be shuffled away to the next location. One possibility is to tour Tempelhof Airport, which was constructed in the Nazi era. Information is available at http://www.tempelhoferfreiheit.de/en/. When most people think of high fashion, they think of Paris and Milan, but one should not neglect Berlin. While any big city has a lot to offer the shopper, Berlin has some special treats for those who wish to splurge on anything from fine clothing to casual wear. No trip to the former West Berlin would be complete without a visit to the Department Store of the West, or Kaufhaus des Westens, normally called by its acronym, KaDeWe (pronounced kaw-de-ve). Not only does it sell the latest clothing sensations, it is a full department store in the traditional sense. The top floor has a remarkable restaurant, where customers can purchase a buffet-style meal that has all the characteristics of a fancy dinner at a fine restaurant. Furthermore, the view of the city is stunning (since Berlin is on the North European Plain, tourists need to take every opportunity to view the city from some sort of height). The no-man's land between East and West Berlin became the developer's dream after the fall of the Berlin Wall. In the two decades after 1989, the area was buzzing with construction, and there still more buildings are underway in the area. In the developed areas, there are several shopping complexes on streets with buildings at human proportions that disguise the skyscrapers. Shops on the streets, urban parks, and indoor malls make this area a popular business district both day and night. Another surprising area that will attract the shopper is the former East Berlin business center just south of the broad boulevard that leads from the Brandenburg Gate to the Schlossbrüche known as Unter den Linden. South of this area, new and quite often very chic businesses have replaced the old establishments from the socialist era. Wandering through this part of Berlin can result in some surprising finds that will empty the pocketbook or at least will provide some interesting eye candy. The view from the dining room of the Kaufhaus des Westens.